The Warriors caused their own demise in Game 4 with choppy play, bad turnovers and mental lapses. While Houston seized the opportunity, Golden State only has itself to blame for the ugly defeat. OAKLAND, Calif. — It was long forgotten by the end of a stunning night, but Steve Kerr identified his team’s fatal flaw at the exact moment it first appeared. Like a basketball version of a smoke detector or check-engine light, Golden State’s coach jolted towards the court to warn of impending danger, unleashing a hurried timeout call midway through the first quarter. It was a mechanical act driven by routine and reflex. In a different context or with a different team, this would have been a hilarious sight: A paranoid coach racing to stop the bleeding after his team had finally given up its first basket after more than five minutes of play. Breaking news! The first shutout in the history of the NBA playoffs had been spoiled. But Kerr’s impulsive instinct, triggered by a sloppy pass from Stephen Curry, was correct. Complacency, Golden State’s oldest and fiercest nemesis, had returned. The Warriors won Game 3 too easily, beating the Rockets by 41 points. They opened Game 4 too easily, building a 12–0 lead. Right on cue, Curry threw a pass he shouldn’t have thrown, and Kerr called for time, hoping the abrupt stoppage would shake his team. It didn’t work. The Rockets defeated the Warriors 95–92 in Game 4 at Oracle Arena on Tuesday, reclaiming home-court advantage by squaring the West finals at two games apiece. This was a script-shredding night on all fronts. Instead of rolling over as in years past, Houston responded to its Game 3 humiliation with steadiness, operating at what coach Mike D’Antoni termed, “the highest level we’ve ever played defensively.” James Harden (30 points, four assists) and Chris Paul (27 points, four assists) both thrived under pressure, piercing Golden State’s defense for four quarters and maintaining total composure down the stretch. Meanwhile, the seemingly invincible Warriors looked as vulnerable as they have since the 2016 Finals, contributing to their own demise with choppy isolation play, passive turnovers, mental lapses, and even premature celebrations. Curry’s flippant early turnover was only the beginning. Klay Thompson was in a rush all night, tossing up multiple airballs and playing so aimlessly that his teammates’ passes bounced off him. While Kevin Durant over-relied on his masterful one-on-one game by turning too frequently to bail-out shots, Draymond Green passed up numerous open looks. And the Warriors collectively squandered multiple double-digit leads by easing up, trusting that their superior talent would get them out of the jams they created for themselves. Much like Game 7 of the 2016 Finals, Golden State’s players didn’t fully comprehend what happened on Tuesday until it was too late. The title slipped from their grasp two years ago because their offense bogged down in the fourth quarter, because Curry’s magical shots dried up at the wrong time, because their lineup shortcomings couldn’t be papered over on the fly, and because stretches of careless play came back to bite them. While Durant’s 2016 arrival was supposed to protect against this combination of factors converging again, history repeated itself anyway. Possession after possession down the stretch, Curry watched Durant dribble and shoot, then Durant watched Curry dribble and shoot. The poster boys for pace-and-space were suddenly clunky and crowded. 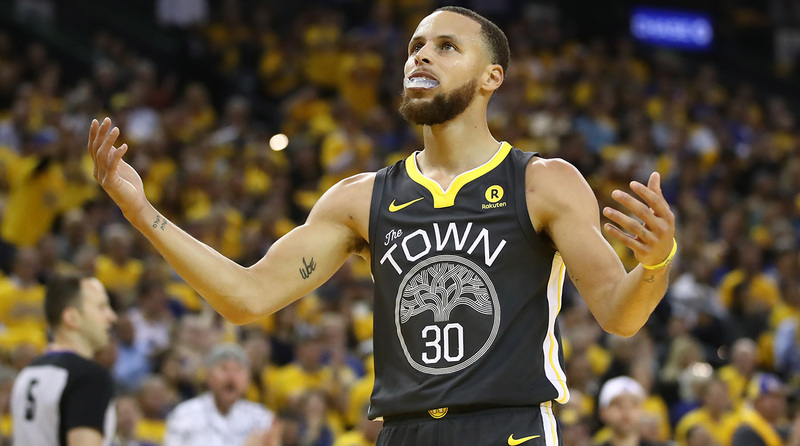 Curry tallied 28 points thanks to a third-quarter burst that he punctuated with a shoulder-shake, but he missed seven of his eight attempts in the final period, including wide-open lay-ups and threes. Durant added a deliberate 27 points, but he missed four of his last five shots and looked jumpy at critical late-game moments. Stretched thin by the absence of Andre Iguodala due to a leg injury, Golden State’s vaunted offense produced more turnovers (4) than field goals (3) in the final period. While Kerr tried to find help—rotating Kevon Looney, Jordan Bell and Shaun Livingston in during the fourth quarter to support his four All-Stars—he never came up with anything meaningful. Golden State’s closing lineups were jumbled, out of sync and surprisingly unprepared for Houston’s intensity. “Now we've got to fight and really understand this is a true playoff–type experience,” Curry said afterwards. That assessment begged the obvious question: What were the first four games of a series featuring the league’s top two teams if not a true playoff experience? Golden State’s approach to the game-deciding sequence smacked of hubris too. Down two with 10 seconds left, Durant pushed the ball up the court. Kerr had two timeouts left, but he opted not to use one, deciding instead to try to capitalize on a defense that wasn’t set. While this might have been a smart decision in a vacuum, the Warriors, tired and lacking in a plan, would surely have benefited from a little time to organize. As the doomed play unfolded, Green signaled for timeout to no avail. Kerr never intervened, telling reporters that he didn’t believe the referees would have been able to see or hear him call for timeout from the bench. Somehow, Golden State just foolishly played on, completing a disheartening fourth-quarter collapse with one more ill-advised decision and one more tough two. This pair of MVPs realized that their trouble on Tuesday ran deeper than a single missed jumper or forced pass. They understood, too late, that Golden State’s critical mistake was not the fourth-quarter timeout Kerr had failed to call, but the lack of focus that had necessitated his frenzied first-quarter timeout. The Warriors had placed a new-school twist on an age-old sports sin: They shimmied before the job was complete.